LO passed her cold to me so I've been really lagging these past couple days. Hopefully I can get over it by the end of the week because I have my brother and his family visiting me for the weekend. I'd hate to be rundown while they're here and then pass a cold onto them as well. Argh, it's been a long long time since I've worn a blue glitter that I really like, and it's a Smitten Polish called The One On The Right. I don't know on the right of what, but it's definitely right. It's a lovely bright blue cream base with large silver and fuchsia glitters mixed with tiny blue and pink glitter. I used two coats in these pics, the first one was thin and the second layer was thick. I had no trouble with application and easily controlled the formula which I found to my liking, just a touch thick to prevent pooling. I finished with a layer of SH Insta Dri but it appeared to dry fairly smooth and shiny on its own. 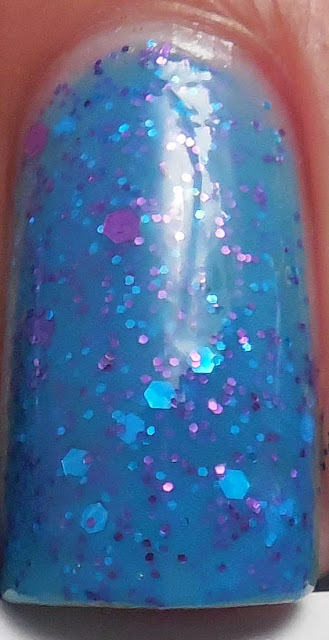 I love how the pink glitter plays off the bright blue in this polish and it's really fun to look at all day. I'm very impressed so far with Smitten polish's creations and I look forward to trying more. Have you had a chance to try Smitten, and which is your favorite? Thank you! As a self proclaimed blue hater, I love this color!